Usual dosage is one capsule daily, or as prescribed by a physician. One tablet daily or as directed by a physician. As an Iron Supplement, one chewable tablet daily, or as directed by a health professional. Before, during, and/or after pregnancy, one softgel capsule daily or as directed by a physician. Selection of patients for treatment with oxycodone hydrochloride should be governed by the same principles that apply to the use of similar opioid analgesics. Individualize treatment in every case, using non-opioid analgesics, opioids on an as needed basis and/or combination products, and chronic opioid therapy in a progressive plan of pain management such as outlined by the World Health Organization, the Agency for Healthcare Research and Quality, and the American Pain Society. the total daily dose, potency and specific characteristics of the opioid the patient has been taking previously; the reliability of the relative potency estimate used to calculate the equivalent oxycodone hydrochloride dose needed; the patient's degree of opioid tolerance; the general condition and medical status of the patient; concurrent medications; the type and severity of the patient's pain; risk factors for abuse, addiction or diversion, including a prior history of abuse, addiction or diversion. The following dosing recommendations, therefore, can only be considered suggested approaches to what is actually a series of clinical decisions over time in the management of the pain of each individual patient. Continual reevaluation of the patient receiving oxycodone hydrochloride is important, with special attention to the maintenance of pain control and the relative incidence of side effects associated with therapy. During chronic therapy, especially for non-cancer-related pain, periodically reassess the continued need for the use of opioid analgesics. During periods of changing analgesic requirements, including initial titration, frequent contact is recommended between physician, other members of the healthcare team, the patient, and the caregiver/family. Oxycodone hydrochloride capsules: 5 to 15 mg every 4 to 6 hours as needed for pain. Titrate the dose based upon the individual patient's response to their initial dose of oxycodone hydrochloride. Adjust the dose to an acceptable level of analgesia taking into account the improvement in pain intensity and the tolerability of the oxycodone by the patient. There is inter-patient variability in the potency of opioid drugs and opioid formulations. Therefore, a conservative approach is advised when determining the total daily dose of oxycodone hydrochloride. It is better to underestimate a patient's 24-hour oral oxycodone hydrochloride dose and make available rescue medication than to overestimate the 24-hour oral oxycodone hydrochloride dose and manage an adverse experience of overdose. Consider the following general points regarding opioid conversions. Conversion From other Non-Oxycodone Opioids to Oral Oxycodone Hydrochloride. In converting patients from other opioids to oxycodone hydrochloride, close observation and adjustment of dosage based upon the patient's response to oxycodone hydrochloride is imperative. Physicians and other healthcare professionals are advised to refer to published relative potency information, keeping in mind that conversion ratios are only approximate. Conversion From Controlled-Release Oral Oxycodone to Oral Oxycodone Hydrochloride. The relative bioavailability of oxycodone hydrochloride capsules compared to controlled-release oxycodone is unknown. The extended duration of release of oxycodone hydrochloride from controlled-release tablets results in reduced maximum and increased minimum plasma oxycodone hydrochloride concentrations than with shorter acting oxycodone hydrochloride products. Conversion from controlled-release tablets could lead to excessive sedation at peak serum levels. Therefore, dose adjustment with close observation is necessary. Conversion From Oral Oxycodone Hydrochloride to Controlled-Release Oral Oxycodone. The relative bioavailability of oxycodone hydrochloride capsules compared to controlled-release oxycodone is unknown, so conversion to controlled-release tablets must be accompanied by close observation for signs of excessive sedation. Continual reevaluation of the patient receiving oxycodone hydrochloride is important, with special attention to the maintenance of pain management and the relative incidence of side effects associated with therapy. If the level of pain increases, effort should be made to identify the source of increased pain, while adjusting the dose as described above to decrease the level of pain. During chronic therapy, especially for non-cancer-related pain (or pain associated with other terminal illnesses), periodically reassess the continued need for the use of opioid analgesics. When a patient no longer requires therapy with oxycodone hydrochloride gradually taper the dose to prevent signs and symptoms of withdrawal in the physically dependent patient. 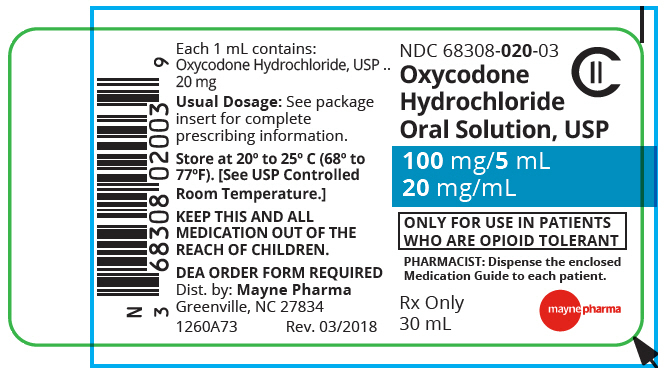 Oxycodone hydrochloride tablets are intended for the management of moderate to severe pain in patients who require treatment with an oral opioid analgesic. The dose should be individually adjusted according to severity of pain, patient response and patient size. If the pain increases in severity, if analgesia is not adequate, or if tolerance occurs, a gradual increase in dosage may be required. Patients who have not been receiving opioid analgesics should be started on oxycodone hydrochloride tablets in a dosing range of 5 to 15 mg every 4 to 6 hours as needed for pain. The dose should be titrated based upon the individual patient's response to their initial dose of oxycodone hydrochloride tablets. Patients with chronic pain should have their dosage given on an around-the-clock basis to prevent the reoccurrence of pain rather than treating the pain after it has occurred. This dose can then be adjusted to an acceptable level of analgesia taking into account side effects experienced by the patient. For control of severe chronic pain, oxycodone hydrochloride tablets should be administered on a regularly scheduled basis, every 4-6 hours, at the lowest dosage level that will achieve adequate analgesia. As with any potent opioid, it is critical to adjust the dosing regimen for each patient individually, taking into account the patient's prior analgesic treatment experience. Although it is not possible to list every condition that is important to the selection of the initial dose of oxycodone hydrochloride tablets, attention should be given to: 1) the daily dose, potency, and characteristics of a pure agonist or mixed agonist/antagonist the patient has been taking previously, 2) the reliability of the relative potency estimate to calculate the dose of oxycodone needed, 3) the degree of opioid tolerance, 4) the general condition and medical status of the patient, and 5) the balance between pain control and adverse experiences. When converting patients from fixed ratio opioid/non-opioid drug regimens a decision should be made whether or not to continue the non-opioid analgesic. If a decision is made to discontinue the use of non-opioid analgesic, it may be necessary to titrate the dose of oxycodone hydrochloride tablets in response to the level of analgesia and adverse effects afforded by the dosing regimen. If the non-opioid regimen is continued as a separate single entity agent, the starting dose oxycodone hydrochloride tablets should be based upon the most recent dose of opioid as a baseline for further titration of oxycodone. Incremental increases should be gauged according to side effects to an acceptable level of analgesia. If a patient has been receiving opioid-containing medications prior to taking oxycodone hydrochloride tablets the potency of the prior opioid relative to oxycodone should be factored into the selection of the total daily dose (TDD) of oxycodone. In converting patients from other opioids to oxycodone hydrochloride tablets close observation and adjustment of dosage based upon the patient's response to oxycodone hydrochloride tablets is imperative. Administration of supplemental analgesia for breakthrough or incident pain and titration of the total daily dose of oxycodone hydrochloride tablets may be necessary, especially in patients who have disease states that are changing rapidly. Continual re-evaluation of the patient receiving oxycodone hydrochloride tablets is important, with special attention to the maintenance of pain control and the relative incidence of side effects associated with therapy. If the level of pain increases, effort should be made to identify the source of increased pain, while adjusting the dose as described above to decrease the level of pain. When a patient no longer requires therapy with oxycodone hydrochloride tablets or other opioid analgesics for the treatment of their pain, it is important that therapy be gradually discontinued over time to prevent the development of an opioid abstinence syndrome (narcotic withdrawal). In general, therapy can be decreased by 25% to 50% per day with careful monitoring for signs and symptoms of withdrawal (see Drug Abuse and Dependence section for description of the signs and symptoms of withdrawal). If the patient develops these signs or symptoms, the dose should be raised to the previous level and titrated down more slowly, either by increasing the interval between decreases, decreasing the amount of change in dose, or both. It is not known at what dose of oxycodone hydrochloride tablets that treatment may be discontinued without risk of the opioid abstinence syndrome. Erythromycin is well absorbed and may be given without regard to meals. Optimum blood levels are obtained in a fasting state (administration at least one half hour and preferably two hours before or after a meal); however, blood levels obtained upon administration of enteric-coated erythromycin products in the presence of food are still above minimal inhibitory concentrations (MICs) of most organisms for which erythromycin is indicated. ADULTS: The usual dose is 250 mg every 6 hours taken one hour before meals. If twice-a-day dosage is desired, the recommended dose is 500 mg every 12 hours. Dosage may be increased up to 4 grams per day, according to the severity of the infection. Twice-a-day dosing is not recommended when doses larger than 1 gram daily are administered. CHILDREN: Age, weight, and severity of the infection are important factors in determining the proper dosage. The usual dosage is 30 to 50 mg/kg/day in divided doses. For the treatment of more severe infections, this dose may be doubled. A therapeutic dosage of oral erythromycin should be administered for at least 10 days. For continuous prophylaxis against recurrences of streptococcal infections in persons with a history of rheumatic heart disease, the dose is 250 mg twice a day. 30 to 40 grams given in divided doses over a period of 10 to 15 days. 250 mg four times daily for 10 to 14 days for adults; 30 to 50 mg/kg/day in divided doses for 10 to 14 days for children. Although optimal doses have not been established, doses utilized in reported clinical data were those recommended above (1 to 4 grams daily in divided doses). Although the optimal dose and duration of therapy have not been established, the suggested treatment is erythromycin 500 mg, by mouth, 4 times a day on an empty stomach for at least 7 days. For women who cannot tolerate this regimen, a decreased dose of 250 mg, by mouth, 4 times a day should be used for at least 14 days. For adults with uncomplicated urethral, endocervical, or rectal infections caused by Chlamydia trachomatis in whom tetracyclines are contraindicated or not tolerated: 500 mg, by mouth, 4 times a day for at least 7 days. Although optimum dosage and duration of therapy have not been established, doses of erythromycin utilized in reported clinical studies were 40 to 50 mg/kg/day, given in divided doses for 5 to 14 days. When tetracycline is contraindicated or not tolerated: 500 mg of erythromycin, orally, four times daily for at least 7 days. 500 mg IV of erythromycin lactobionate for injection, USP every 6 hours for 3 days followed by 250 mg of erythromycin, orally every six hours for 7 days. Adults: The usual dose of oral doxycycline is 200 mg on the first day of treatment (administered 100 mg every 12 hours), followed by a maintenance dose of 100 mg daily. The maintenance dose may be administered as a single dose or as 50 mg every 12 hours. In the management of more severe infections (particularly chronic infections of the urinary tract), 100 mg every 12 hours is recommended. For pediatric patients above eight years of age: The recommended dosage schedule for children weighing 45 kg or less is 4.4 mg/kg of body weight divided into two doses on the first day of treatment, followed by 2.2 mg/kg of body weight given as a single daily dose or divided into two doses on subsequent days. For more severe infections up to 4.4 mg/kg of body weight may be used. For children over 45 kg, the usual adult dose should be used. Uncomplicated urethral, endocervical, or rectal infection in adults caused by Chlamydia trachomatis: 100 mg by mouth twice-a-day for 7 days. Uncomplicated gonococcal infections in adults (except anorectal infections in men): 100 mg, by mouth, twice-a-day for 7 days. As an alternative single visit dose, administer 300 mg stat followed in an hour by a second 300 mg dose. Doxycycline hyclate delayed-release tablets may also be administered by carefully breaking up the tablet and sprinkling the tablet contents (delayed-release pellets) on a spoonful of applesauce. The delayed-release pellets must not be crushed or damaged when breaking up the tablet. Any loss of pellets in the transfer would prevent using the dose. The applesauce/doxycycline hyclate delayed-release tablet mixture should be swallowed immediately without chewing and may be followed by a glass of water if desired. The applesauce should not be hot, and it should be soft enough to be swallowed without chewing. In the event that a prepared dose of applesauce/doxycycline hyclate delayed-release tablet cannot be taken immediately, the mixture should be discarded and not stored for later use. Dosage should be adjusted according to the severity of the pain and response of the patient. However, it should be kept in mind that tolerance to hydrocodone can develop with continued use and that the incidence of untoward effects is dose-related. One or two tablets every four hours as needed. Total daily dosage should not exceed 6 tablets. Dosage should be adjusted according to the severity of the pain and the response of the patient. It may occasionally be necessary to exceed the usual dosage recommended below in cases of more severe pain or in those patients who have become tolerant to the analgesic effect of opioids. If pain is constant, the opioid analgesic should be given at regular intervals on an around-the-clock schedule. Oxycodone and acetaminophen tablets are given orally. The total daily dose of acetaminophen should not exceed 4 grams. In patients treated with oxycodone and acetaminophen tablets for more than a few weeks who no longer require therapy, doses should be tapered gradually to prevent signs and symptoms of withdrawal in the physically dependent patient. Oxycodone hydrochloride oral solution is available in two concentrations: 5 mg per 5 mL and 100 mg per 5 mL (20 mg per mL). Take care when prescribing and administering oxycodone hydrochloride oral solution to avoid dosing errors due to confusion between mg and mL, which could result in accidental overdose and death. Take care to ensure the proper dose is communicated and dispensed. When writing prescriptions, include both the total dose in mg and the total dose in volume. Always use the enclosed calibrated oral syringe when administering oxycodone hydrochloride oral solution, 100 mg per 5 mL (20 mg per mL), to ensure the dose is measured and administered accurately. Start patients who have not been receiving opioid analgesics on oxycodone hydrochloride in the following dosing range using oral solution, 5 mg per 5 mL strength. Oxycodone hydrochloride oral solution: 5 to 15 mg every 4 to 6 hours as needed for pain. Titrate the dose based upon the individual patient's response to their initial dose of oxycodone hydrochloride. Adjust the dose to an acceptable level of analgesia taking into account the improvement in pain intensity and tolerability of the oxycodone by the patient. The 100 mg per 5 mL (20 mg per mL) oral solution formulation is for use in opioid-tolerant patients only who have already been receiving opioid therapy. Use this strength only for patients that have already been titrated to a stable analgesic regimen using lower strengths of oxycodone hydrochloride and who can benefit from use of a smaller volume of oral solution. Instruct patients how to measure and take the correct dose of oxycodone hydrochloride oral solution. Advise patients to always use the enclosed oral syringe when administering oxycodone hydrochloride oral solution 100 mg per 5 mL (20 mg per mL) to ensure the dose is measured and administered accurately. The relative bioavailability of oxycodone hydrochloride oral solution compared to controlled-release oxycodone is unknown. The extended duration of release of oxycodone hydrochloride from controlled-release tablets results in reduced maximum and increased minimum plasma oxycodone hydrochloride concentrations than with shorter acting oxycodone hydrochloride products. Conversion from controlled-release tablets could lead to excessive sedation at peak serum levels. Therefore, dose adjustment with close observation is necessary. The relative bioavailability of oxycodone hydrochloride oral solution compared to controlled-release oxycodone is unknown, so conversion to controlled-release tablets must be accompanied by close observation for signs of excessive sedation.